The objective and ambition of the company is to become the European expert regarding the manufacturing of Stand-Up Paddleboards which will achieved by offering custom boards tailored to all forms of this exciting sport (Race, Surf, Fitness, White water, hiking). The brand will also offers a variety of equipment and accessories specifically designed for SUP: paddles, board bags, leashes. To accomplish this dream, Patrice REMOIVILLE, has built a complete production facility in France, located in the village of Plescop, just outside of Vannes in Brittany (within 3 km of the RN 165). At 3 BAY, you can customise the dimensions, materials used and decorations of your Stand Up Paddleboard and Prone paddle to a length of 18 ‘. The workshop also offers a repair service for all types and brands of Stand-Up Paddle. 3 BAY sells its products directly and exclusively to paddle boarders from the workshop and its online store. Because Patrice (aka Roro) has 3 favourite Bays: The shores of the Gulf of Morbihan, where he has lived for the past 3 years “Morbihan Bay” in English. Byron Bay in Australia, the home town of his wife Kerry and then of course the city of Bayonne, his hometown. Patrice REMOIVILLE, 51, is originally from a region in France called, “Les Landes”, the surf capital of France. He has many years of experience manufacturing surfboards and Stand-Up-Paddleboards. He started shaping windsurfing boards at the age of 16 and embarked on his career in shaping surfboards by partnering with Pierre Cazadieu (aka Zaka), another renowned French shaper, to create the brand KOUNGAT in Vieux-Boucau in 1987. In 1989, he was recruited by Maurice Cole, the charismatic Australian shaper, who started the French arm of RIP CURL, to help manage its Capbreton workshop. He then worked as a glasser for the Spanish brand PUKAS (1993), which inspired him to create his own business subcontracting stratification of surfboards in Capbreton: RORO GLASS (1994). 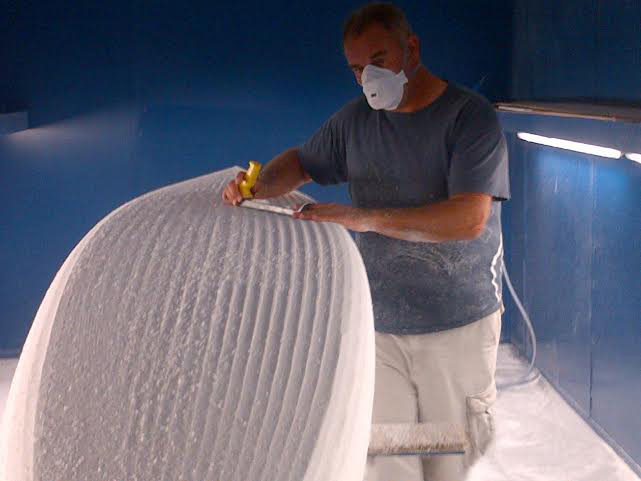 He then founded SURFOAM, in Hossegor (1998-2008) becoming the sole French manufacturer of “polyurethan foam blanks”; the raw material used by all shapers. 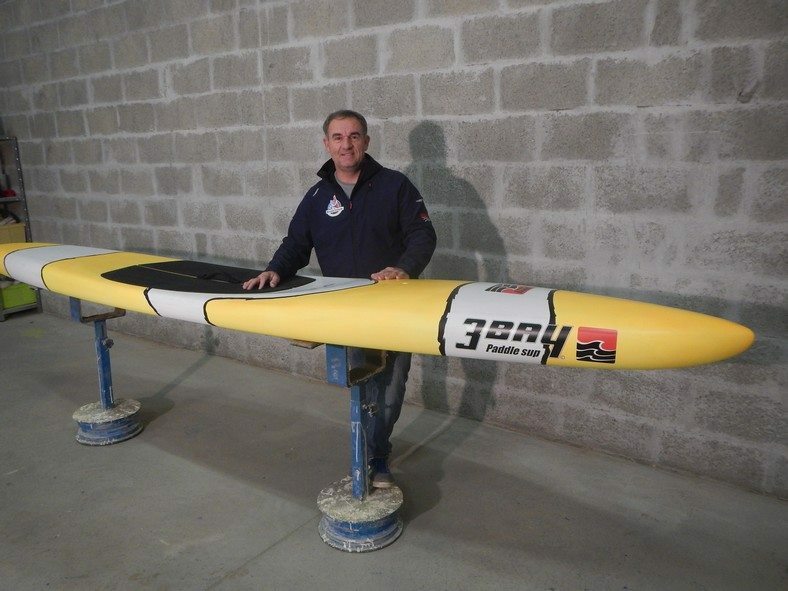 In 2010 he created a small workshop of custom Stand up Paddle: AVP paddleboards, in Capbreton. In 2011 Patrice was recruited by BIC SPORT to become the company Stand Up Paddle Product Manager. He was in charge of design and range development, sales for France and promotion of the sport. In this role he managed team riders and travelled to all the races and championship both in France and Internationally. His designs received Awards in North America. He left BIC in April 2015 to return to his first love: the artisanal Shape. It is the continuation of the story which begun with AVP paddleboards, starting this new adventure ‘made in France’ which is already being much talked about by industry insiders.